Until recently, there has been a companion show to Doctor Who called Doctor Who Confidential. This airs after the main show and showed behind the scenes footage. It was a cool show that talked about the legacy of Doctor Who as well as showed spiffy filmmaker tricks. Then sometimes you just get to see the actors goof off. 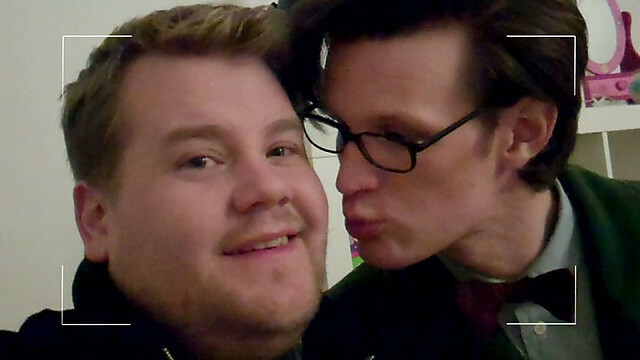 In this segment that corresponded with "Closing Time", Matt Smith and James Corden (Craig) found a camera and played with some toys. You can see why Smith and Corden are award winning actors. What did you think? Was that adorable? Did you hear that James Corden won a Tony recently? Yeah, he actually beat Philip Seymour Hoffman. Have you seen anymore Doctor Who Confidential? Just watched it, and what a thrilling masterpiece of television! I can't wait for the epic conclusion. I need to know how Craig gets out of this much sooner than the next Craig episode! Okay, it's a bit of fun not even taken seriously by the actors. It might be a good example of how one reacts to being part of a gigantic phenomenon older than you. If you told me that this is an extension of how Matt Smith played with his toy Dalek when he was a kid, I'd believe you except for the fact that he'd never seen the show until he was cast. ...seeing actors be completely ridiculous. I love how James Corden starts "singing" the Doctor Who theme at the end. My dog was sitting next to me and did not approve of the sound. Fun little video. This was pretty funny. I want a buttload of Dalek toys now. Playing "I am the Doctor" over it made it even better. Unrelated: I set "I am the Doctor" as my morning alarm tone... I don't like it near as much as I used to. I haven't seen this full episode yet of Confidential, but I had seen a longer version of this scene. I'm so entertained by how these actors are actually fans of the show. This isn't just a paid job, but clearly a lot of fun that they would choose to do this on their own. Also if you're hired as The Doctor, that means you have to be the best at playing with toys because you have the voice down pat. This is silly fun. I wanna see a Dalek on Toy Story. It must be awesome playing Doctor Who with the actual voice of Doctor Who. I Am The Doctor is my ring tone. I usually only get called by my workplace, my mother, or people I don't know. Also losing some charm. Also, I want to see Matt Smith playing with an Eleventh Doctor action figure now, thanks to this discussion. This just reconfirms my belief that Matt Smith is basically playing his quirky self as he plays the Doctor. This also reminds me that I love Doctor Who Confidential and I need to rewatch all of them!!! Sadly though, aren't they stopping Doctor Who Confidential? Yes, Confidential ended with series 6. The script to screen children's writing contest that they started moved to Blue Peter, so maybe Blue Peter will have more Confidential-ish stuff in general. But probably not much, because they're not a Doctor Who show, they're a kids' show. Hey Austin, the Daleks are probably the most-recurring celebrity guests on Blue Peter. That show seems to have been snubbed in this marathon.